The story of a Houston teen found shoeless and distressed after he was allegedly kidnapped from a bus stop earlier this week has come under major scrutiny. 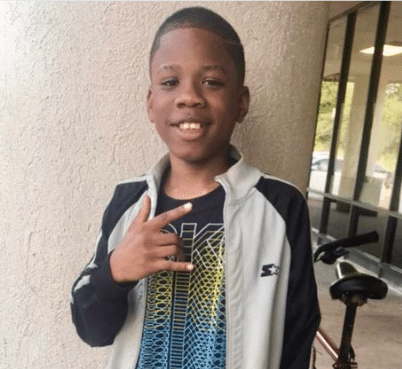 Folks are now questioning the claims of 13-year-old Zavion Parker, who told police he was abducted by a group of men shortly after he got off the school bus Monday. The teen, who was headed home that afternoon, said four or five older teens approached him and forced him into a four-door truck with flames painted on the sides. Parker said he was then driven to a vacant cabin where he was assaulted. The teen recalled being driven by an older white man with orange hair and “I hate Black people” tattooed on his arm. He said the suspects robbed him of his keys, jacket, his phone and his shoes. When the group went into a separate room to load an alleged gun, Parker said he ran for his life. That’s when witness Camecia Carmouche said she saw the frightened boy running down the street shoeless and immediately contacted police. Carmouche live-streamed the incident on Facebook as she explained to police what young Parker told her what happened to him. Carmouche added that there were reportedly other Black victims inside the cabin, according to what Parker told her. The teen also claimed he saw several guns and torture weapons at the shack. The young woman’s account did little to quell public skepticism about the incident, however. I’m sure it will be very difficult to find a big guy with long orange hair who drives a truck with flames on it and has “I Hate Black People” tattooed on his arm. LOL, do people actually believe this family’s story? @TVAshleigh I’m reading tweets abt Zavion Parker, the 13 yr old from Texas that said he was kidnapped & assaulted after school due to his race. The tweets note Zavion saw 2 dead bodies at the location the men took him. I’m not finding any news regarding the dead bodies. Fake? In a series of tweets, a local reporter named Erica Simon, gave several updates on the police investigation into Parker’s abduction. On Tuesday, she reported that seven Houston police officers were on the scene of an abandoned shack not far from the teen’s home. The cops allegedly found a wooden chair, shell casings and several weapons inside. Last night, HPD responded to Zavion’s home to follow up on a lead. He, his mom and Camecia (the driver who found him) led officers to the cabin/shack Zavion described. According to them — officers recovered a wooden chair, shell casings and weapons. Waiting to hear an official word back from HPD. What they can say depends on where they are in the investigation. Local police officials have remained tight-lipped about the case, saying “it’s still an active investigation.” Parker’s mom, Michelle Lee, has been asked to bring her son in to talk to a detective about what happened, according to Simon. The Houston Independent School District said it alerted parents about the teen’s attempted kidnapping and has plans to increase police patrols around his school.